As part of an economic stimulus package, the Japanese government is spending two trillion JPY for cash handouts to boost consumer spending. 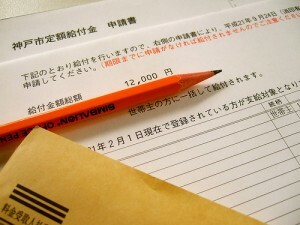 To put it simply, all Japanese citizens and those registered as residents all Japanese citizens in the Basic Resident Register and those registered in the Foreign Resident Register will receive 12,000 JPY, or 20,000 JPY for those under 18 or over 65, once they've lodged their application forms. Local municipalities are in charge of the administration, an unwelcome increase in workload that coincides with the change of the fiscal year. As of mid-April, around half of the municipalities have sent out application forms to their residents. Soka City in Saitama Prefecture and Obu City in Aichi Prefecture offer English translations of the program overview. Bringing to mind a similar program conducted in 1999 that is now commonly regarded as a failure, the program is highly unpopular with the public, mainly because the actual economic effect is unclear. The government expects an increase in real consumption expenditure by 0.2%, but there seems to be no clear consensus on how much of the two trillion yen will actually go to new spending. Predictions range from 20% to 60% and everything in between. For the past couple of months, polls have shown that many Japanese view the program as a clumsy and condescending ploy to gain ratings by the Aso Cabinet. Yaranaio: Isn't it obvious? Prime Minister Aso is trying to raise his approval ratings for elections by distributing two trillion yen, even though the economic impact is trivial! Yaruo: That's what I thought you'd say. Let me ask this, do you really think that his approval ratings will increase with the execution of a program which more than half of the Japanese are against? Coupled with other factors however, including highway toll discounts, it just might be working. Recently, Asahi Shimbun has reported that Prime Minister Aso's approval ratings have risen 4% to 26% since March. Blogger tetsu makes a pun on Teigaku kyufu kin(定額給付金), which literally translates as ‘handouts of a fixed amount’. Teigaku kyufu kin(定額給付金) should be called teigaku kanpu kin (低額還付金) – ‘return of a small amount’ or more accurately, ‘a desperate attempt at using excess taxes to hand out cash by a ruling party whose approval rates are under 20%’. Make no mistake! We're not ‘receiving’ handouts. We're simply ‘getting some of it back’. It feels like a bonus, but if you think about it, the money comes from taxes. It's just a matter of having a part of what was taken from us returned, and I remain in conflict over the situation. Oh well. I did what any ordinary person would do and accepted what was being given away.